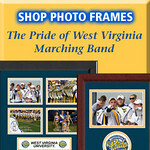 In Partnership with Church Hill Classics, CDS Media Solutions is offering a variety of "Pride" logo photo frames. At this point, frames are only available for 4x6 and 5x7 prints (vertical and horizontal). Frames for other sizes will be added in the near future.